As the Bible predicted, Jerusalem is a “cup of trembling for all the nations” and it is in the very center of world conflict with the UN planning to create a “Two State Solution” by dividing the City of David. 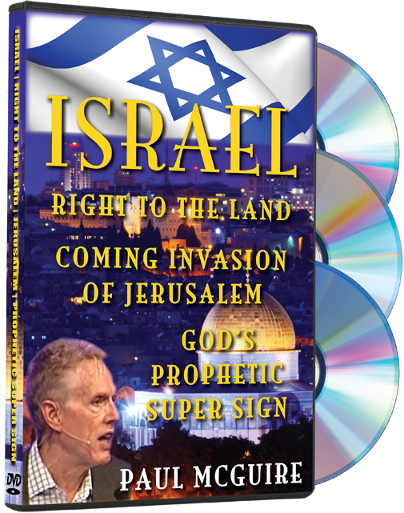 Paul explains how Israel is God’s prophetic super sign in the Bible. He teaches how the Old Testament prophets predicted that the Jews would return to the land of Israel in a spiritual condition of unbelief in the last days. Jesus Christ will defeat the Antichrist, the False Prophet and all those who have received the mark of the beast and He will rule and reign from Jerusalem with King David in a 1,000 year rule called the Millennium. A New Earth, a New Heaven and a New Jerusalem will come into being and Paradise will be restored. The final proof that God is not finished with Israel is the fact that Jesus Christ returns to Jerusalem at His Second Coming to rule and reign Planet Earth from Israel. This is the ultimate fulfillment of the Abrahamic Covenant! Interview with Israeli General Shimon Erem discussing Israel, Terrorism, Iran and The Plan of Militant Islam! Plus an Exclusive Interview with Prime Minister Ehud Olmert!